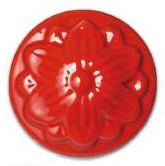 Bright red coloured glaze from colorobbia. Use directly onto bisque and cover with clear glaze if required. Will self glaze if no clear glaze used.